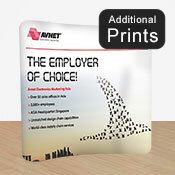 Exhibition display stand sets up in 5 minutes without any tools required! Also available in 2.2 x 3m & 2.2 x 6.1m options! 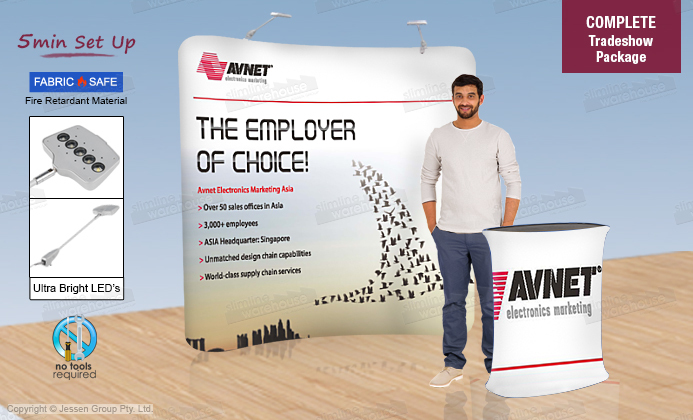 This exhibition display stand has everything you need to create an attractive booth at your next event, whether for trade shows, expos, retail stores, or shopping centres. 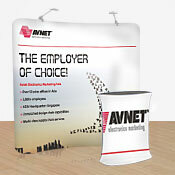 The trade show pop up uses an aluminium frame that is lightweight and durable for use at any event. Assembly takes only 5 minutes without any additional tools needed! 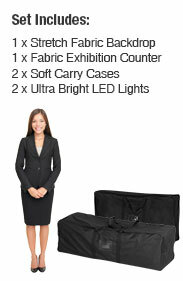 The popup display is portable as well, with (2) carrying bags included to bring the entire kit to and from events with ease! An exhibition display stand, like fabric expo displays, has custom designs digitally printed onto polyester fabric wraps using dye-sublimation for vivid full colours that don't fade. The polyester fabric is made from flame retardant and machine washable materials for safety. 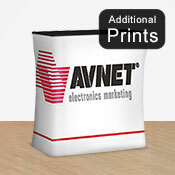 The wraps zip around both the main backdrop as well as the greeting counter to offer a complete kit! There are also (2) LED lamps available that attach to the top of the stands to illuminate the popup and draw further attention towards your booth! Our online catalogue has hundreds of products in stock today for you to choose from, with this vast selection including many different categories appropriate for many businesses types. 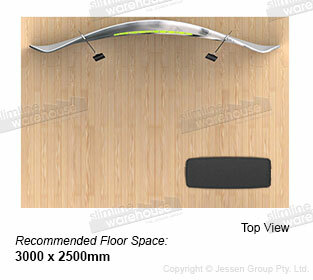 With over 20 years in the business, Slimline Warehouse is a leading provider of high-quality goods at low prices. Orders paid prior to 1pm EST will despatch same day to Sydney, Melbourne, Perth, Adelaide, Brisbane, Cairns, Gold Coast, & anywhere else in Australia!